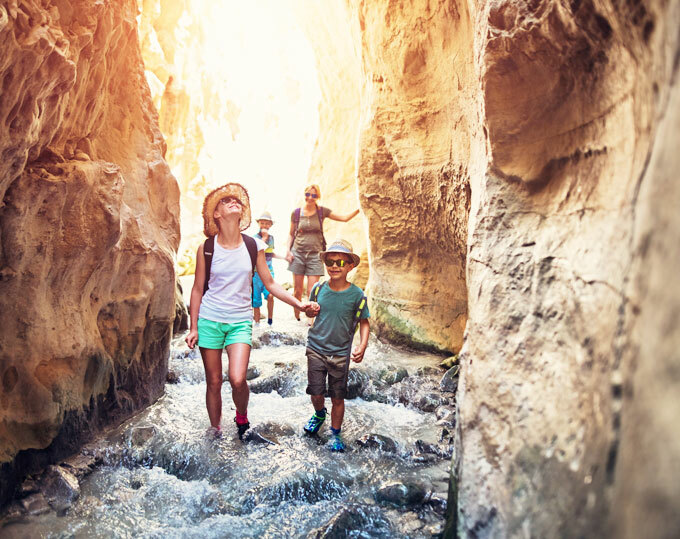 From the Movie Colony Hotel in Palm Springs, you're just a ten-minute drive the scenic and culturally diverse Tahquitz Canyon trail, located in the Agua Caliente Band of the Cahuilla Indians Reservation. The challenging trail takes you into the canyon where you'll end up at a gorgeous 60-foot waterfall. While the trail is only one mile, its full of rocky terrain and steps, making for an exciting and invigorating hike - with the reward of beautiful vistas. You'll have your choice of self-guided hikes between 7:30 a.m. and 3:30 p.m. and ranger-led interpretive hikes, which take place every two hours from 8:00 a.m. to 2:00 p.m and are included free with admission. What are some tips for hiking Tahquitz Canyon? A Before you hike the trail, there are definitely some tips to keep in mind. Tahquitz Canyon has a tiny amount of shade and it will be hot. You’ll want to make sure to have a hat, sunscreen, and plenty of water as there are no water fountains at the canyon. In addition, good hiking or athletic shoes are a must. For your safety, footwear with leather soles or high heels, as well as flip flops, are not recommended. Are there are any restrictions to hiking Tahquitz Canyon? A The following rules are strictly enforced so please follow them. You must always stay on Tahquitz Canyon Trail. Climbing on the rocks and climbing above Tahquitz Falls is prohibited. In addition, you’re not allowed to swim, smoke or litter. No alcoholic beverages or pets are permitted, either. And if you’re considering taking photographs for commercial purposes, you’ll need to get a permit.